Summary : If you like strawberries, well, I have the tea for you. Culinary Teas Springberry Herbal Tea is a tea that says strawberry all over it, from its aroma, to its final look to its taste. Review : I have no life. Yes, it is true. Here I am at 4am, drinking tea, and working on this website. So just shoot me...well, ok, be nice and don't do that. Yet, at 4am I find myself in need of a pick-me-up of some kind. I don't like drugs, so off I went to look through my exotic tea collections, searching for something different. Something that says "summer" on it...as it is now my most hated time of the year...December. And while on this search I dug up a forgotten about herbal tea from Culinary Teas called Springberry Herbal Tea. Well...that is better. Yeah, it doesn't say summer on it...but that is ok. I'll take spring right about now too, since springs in Northwest Nevada are darn nice too. I opened up the package that this tea came wrapped up in and, wow, what a surprise. Talk about fruit pieces. The fruit pieces in this tea are big enough to use to play baseball, or at least use as a weapon of last resort to fend off any muggers that come your way. 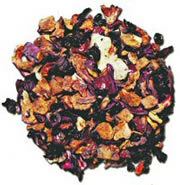 This tea from Culinary Teas contains the following ingredients : Hibiscus petals, Rosehip chips, Dried apple pieces, Dried strawberries, Dried currants, Dried banana, Natural Flavors. Here is how Culinary Teas describes this tea on their website : "The delicious blend of fruit, strawberry and natural flavors in Springberry herbal tea create a reminder of New England summers. The flavor notes of strawberry are particularly inviting and refreshing." And you know what, this description was spot-on in terms of accuracy. When I first saw the brewed version of this tea, my first thought was...hey...a Vermont summer! The tea has a gorgeous strawberry color to it, sort of a odd-pink/red color to it. It is quite pretty to look at, very pretty in fact. So, what did this tea taste like? Well...how about fruit and strawberries. The flavor of strawberry is very pronounced in this tea. Yet, you'll also get several other fruit flavors that are so inter-mixed that it is difficult to tell them apart. In the end, if you like fruit...and in particular strawberries...then this tea is for you. And even if you don't, this tea is still gorgeous to look at. So perhaps brew the tea up and put it on your wall in a pretty vase? Recommendation : Yes. If YOU = Strawberries, then this tea has your name on it. And if you like general "fruity" teas, you will also like this tea. On the other hand, if strawberries aren't your thing...then I would take a pass on this tea. I should also add...I suspect that this tea makes for a wonderful ice tea too!